What concentration of chlorine will kill septic bacteria? How does chlorine get into a private septic system? Is it a problem? When are chlorine or other disinfectants needed for aerobic or other septic systems? Will septic tank chlorine damage the septic tank or leach fields? This article series explains how to extend the life of the septic system by being careful about what goes into it. EFFECTS ON SEPTIC OF WELL SHOCK? In locations where wastewater effluent must be sanitized by chemical treatment before it is discharged to the environment, chlorine products and various dosing methods may be used in some system designs. For example some sand bed filtration systems produce effluent that is treated with chlorine injection before the final discharge of effluent to the environment. . These are alternative septic system designs which are intended to be chemically treated including using disinfectants such as calcium hypochlorite or chlorine. The previous section which discussed water chlorinators for drinking water does not normally pertain to chlorine-dosing septic systems. Reader Question: What levels of chlorine or concentrations of chlorine will disinfect wastewater or harm a drainfield? Drinking water system officials won't disclose mistaken chlorine residual rate that was high enough to kill biotic action in septic systems. We believe it occurred over a 6 month period, April to September, which is when I discovered and reported our systems failures. I do not know when the others were discovered. According to the US EPA, the level of chlorine needed to disinfect clarified wastewater effluent ranges between 5 and 20 mg/L.
. In this case, which could be taken as the upper limit when trying to understand how much chlorine would be needed to effectively kill off the necessary soil bacteria and biofilm in an onsite wastewater system or septic system, the bleach levels would be higher for cloudy or debris-containing water than for normal drinking water, and higher still for sewage - almost impossible. When treating drinking water we use about 10 drops of 1% bleach or 2 drops of 4-6% chlorine bleach per quart of water. One liquid drop (varying by liquid viscosity and other factors) is about 0.025 cc or 0.0009 fluid ounces. One Quart contains 32 fluid ounces. or converting this to a percent and ignoring the added volume of the droplets to the total volume, that's 100 x 0.00005625 = 0.005625% solution. As you can read in various expert sources, disinfecting wastewater is not easy. For optimum performance, a chlorine disinfection system should provide rapid initial mixing and a plug flow contact regime. The goal of proper mixing is to enhance disinfection by initiating a reaction between free chlorine and ammonia nitrogen. This helps to prevent free chlorine from reacting with organic carbon compounds and forming hazardous byproducts. In order to allow appropriate time for the disinfection reaction, the contact chamber should be designed with rounded corners to eliminate dead flow areas. It should also be baffled to minimize short-circuiting. This design allows for adequate contact time between the microorganisms and a minimal chlorine concentration for a specific period of time. - Op. Cit. Keep in mind that this is for clear water. The level of microbial contaminants in sewage is enormously higher so that the concentration of bleach needed to kill all of the bacteria alone would be a much much greater amount. For example, Caldwell (1946) pointed out that you'd need 10 ppm of chlorine to kill algal sells in a wastewater pond. Chlorine Disinfection Fact Sheet, US EPA 832-F-99-062 September 1999"
Caldwell, D. H. "Sewage oxidation ponds: performance, operation and design." Sewage Works Journal (1946): 433-458. Debartolomeis, J. A. M. E. S., and VICTOR J. Cabelli. "Evaluation of an Escherichia coli host strain for enumeration of F male-specific bacteriophages." Applied and Environmental Microbiology 57, no. 5 (1991): 1301-1305. Green, D. E., and P. K. Stumpf. "The mode of action of chlorine." Journal (American Water Works Association) (1946): 1301-1305. Darby, J., M. Heath, J. Jacangelo, F. Loge, P. Swaim, and G. Tchobanoglous, 1995. Comparison of UV Irradiation to Chlorination: Guidance for Achieving Optimal UV Performance. Water Environment Research Foundation. Alexandria, Virginia. Tsai, Chu-Fa. "Effects of chlorinated sewage effluents on fishes in Upper Patuxent River, Maryland." Chesapeake Science 9, no. 2 (1968): 83-93. Metcalf & Eddy, Inc., 1991. Wastewater Engineering: Treatment, Disposal, and Reuse. 3d ed., The McGraw-Hill Companies. New York, New York. Task Force on Wastewater Disinfection,1986. Wastewater Disinfection. Manual of Practice No. FD-10. Water Environment Federation. Alexandria, Virginia. Is it OK to Flush Swimming Pool Backwash into a Septic Tank and Drainfield? Below is our informal analysis in reply to this interesting question from a reader. The reader proposed backwashing a swimming pool into a large septic tank and an unknown drainfield size, using two alternative load levels which we describe as two options. Note: The author (D Friedman) is not a septic design engineer. The following comments are opinion based on research and experience and should be amended by a septic engineer and adjusted for the specifics of your particular case. 5000 gallons of wastewater at 2 ppm chlorine dumped into a 10,000 gallon tank at 355 gpm would mean running that volume of water into the tank in about 15 minutes. Your septic tank will reach about 1 ppm of chlorine at that rate before it is further diluted by other wastewater. A concentration of 1 ppm chlorine in a septic tank is unlikely to kill all of the septic tank and drainfield bacteria off severely immediately but over time may reduce the total bacterial activity. There is a risk that putting such a large volume of water from a swim pool into a septic tank or onto the drainfield would ruin the septic system. High entry rate in gpm of water into the septic tank is also likely to be a problem. Pumping wastewater into the septic tank at 355 gpm is also likely to be a much faster rate of water insertion than normally occurs from a residential building served by a septic tank. This surge and flow rate may agitate the septic tank contents, increasing the level of suspended solids significantly. A typical residential septic tank and drainfield are designed to receive about one tenth of the pool backwash volume twice a day - or about 1000 to 1200 gallons a day. 5000 gallons of water into a tank during one day is about the same as the wastewater usage from perhaps 50 people in a building. That is 2 ½ times the expected usage level for a 5000 gallon septic tank. High volumes of water from a swimming pool into a septic tank will also flood the tank and prevent proper processing of the waste therein. Flooding a septic tank means that the users are pushing a high level of suspended solids, abnormally high in addition, out into the drainfield - there is not enough settling time -shortens the drainfield life or ruins it promptly. You would have to tell me that your septic engineer designed the drainfield to handle surges in wastewater volume at a level equal to the sum of the usage load from the building it serves plus the swimming pool. I'd be surprised if someone were willing to foot the bill for such an over design - some sites won't have sufficient space for a working drainfield of the size needed to handle what amounts to a more than 50 person load. Spreading out the load by only backwashing every other day or two is unlikely to be sufficient to allow the tank or field to recover. You should not discharge swimming pool backwash into a septic tank. Doing so will flood the tank and push solid waste into the drainfield and there may be some temporary reduction in the bacterial activity, reducing the treatment level in the septic tank and thus increasing the BOD and suspended solids. You should not discharge swimming pool backwash anywhere within 100 feet of a drainfield. Doing so is likely to saturate the soil, interfere with drainfield treatment of septic effluent, and possibly harm soil bacteria. Option 2: gravity for a total load of 320 gals per month. Chlorine levels are expected to be at 2ppm. A once a month additional load of 320 gallons into a septic tank, especially a large 5000g unit, is the equivalent of about 3 more people of load once a month - which should not be a significant percentage increase in load compared to the design level of a 5000 g tank. The chlorine load of swimming pool water at 2 ppm may have a small impact on bacteria in the tank but at an infrequent insertion is unlikely to have any lasting impact so long as the system is also in normal use as a septic tank receiving black water from a building. As above, a once a month additional load of 320 gallons into a septic tank, especially a large 5000g unit, is the equivalent of about 3 more people of load once a month - about the same as having a few visitors for a weekend. I would not expect the water volume to have a significant impact on the system. In general it is better for a septic system to reduce rather than increase the water load into the tank and drainfield. If the septic tank were a typical residential 1000g or 1200g tank, the impact of these wastewater loads could be significant. At WELL CHLORINATION & SHOCKING we describe the procedure for sanitizing a drinking water well. This procedure is used following certain well, pump, or plumbing repairs and it is often used in a first-stage attempt to diagnose (and on occasion "cure") bacterial contamination of well water. For a 100' deep well column of water (that is 100' of water is in a 6" steel casing - we don't care the actual well depth, just the amount of water in the well) we suggest using 3 cups Clorox™ to shock the well. Actually when you are running water into a building as part of flushing out and sanitizing a well, the volume of water being treated is greater as you are drawing water out of the well, more water is running into the well from the earth, and that more dilute solution is entering the building water tank and piping. 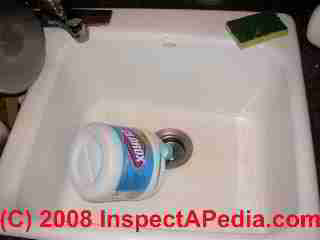 Commercial "chlorine" bleaches usually contain 3 to 6% sodium hypochlorite (NaClO). Some bleaches also contain detergents and thickening agents, and other oxygen bleaches using hydrogen peroxide do not contain any chlorine and are based on peroxy-compounds. Bleach in sufficient concentration and at sufficient exposure time will kill bacteria (by attacking certain proteins in the bacteria) and some other pathogens. The temperature of the water-bleach solution also impacts the necessary exposure time (colder means you need longer exposure for the disinfectant to be effective). How Many Drops of Water (or bleach) are in One Gallon? At DRINKING WATER - EMERGENCY PURIFICATION we discuss procedures for purifying drinking water, and the concentration of disinfectant needed. There we suggest that 8 drops of bleach will purify one gallon of water. If we assume that the viscosity of commercial bleach is about the same as water, a gallon of bleach contains 90840 drops that would "treat" about 11,000 gallons of water in the conditions described in that article - starting with water that is "close to drinkable" - that is, it is not sewage in a septic tank. One U.S. gallon = 128 oz., so one ounce of bleach is about (90840 drops / 128 ounces) or 700 drops of liquid per ounce. Finally (5,600 drops / 8 drops to treat one gallon) means one cup of bleach will treat about 700 gallons of water for drinking purposes with a 30 minute exposure time. How Much Water is In the Well Being Shocked? A 100 foot deep column of water in a standard 6" well casing will equal about (1.5 gpf x 100) 150 gallons of water. So the health department rule of thumb that suggests we use 3 cups of bleach to shock a 100 foot deep well means we are using a concentration 12 times stronger than we would just to produce drinking water. (700 /150) x 3 cups. This extra strength chlorine solution must be intended to accommodate disinfection of contaminated surfaces in the well casing, the pump, the piping, water tank, and fixtures, and to handle the dilution that occurs when we run water through the building plumbing system in the well shock procedure. To look at the effect of shocking the well on a septic tank, let's guess that we dilute the disinfecting solution not at all. When we flush out the water system after shocking the well let's put about our 150 gallons of water right into a typical 1,500 gallon septic tank, without allowing for the additional dilution that will actually occur as we continue to run water out of our well and through the plumbing system until we no longer smell any chlorine at our sink faucets. Our 150 gallons is joining a volume ten times larger (1,500 gallons) in the septic tank, so it is diluted by a factor of ten - we're back to a level close to the sanitation of normal drinking water. Finally, considering that the concentration of sewage bacteria in the septic tank is enormously more than the original concentration of bleach in drinking water could have purified, it is not at all likely that following normal well shocking procedures would damage the septic system due to its chlorine concentration. Details about the effects of chlorine (in bleach for example) on soils and on ocean bodies or freshwater bodies are at WASTEWATER BIOCOMPATIBILITY. Continue reading at CHLORINE IMPACT on SEPTIC or select a topic from closely-related articles below, or see our complete INDEX to RELATED ARTICLES below. CHLORINE SOURCES in WASTEWATER at InspectApedia.com - online encyclopedia of building & environmental inspection, testing, diagnosis, repair, & problem prevention advice. Chlorine kills bacteria, including disease-causing organisms and the nuisance organism, iron bacteria. However, low levels of chlorine, normally used to disinfect water, are not an effective treatment for giardia cysts. A chlorine level of over 10 mg/1 must be maintained for at least 30 minutes to kill giardia cysts. -- http://ohioline.osu.edu/b795/index.html is the front page of this bulletin. Ohio State University article on the concentration of chlorine necessary to act as an effective disinfectant, and the effects of the water's pH and temperature: See http://ohioline.osu.edu/b795/b795_7.html for details.